Thank you for registering to be an organ, tissue and eye donor. Becoming an organ, tissue and eye donor truly shares life with others. 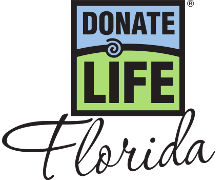 By putting your name on Florida’s organ, tissue and eye donor registry, you consent to having your organs, tissues and eyes made available for transplantation upon death. Examples of organs for life-saving transplants include heart, liver, pancreas, kidneys, lungs and small bowel. Examples of tissues that could save or enhance someone’s life include eyes, corneas, heart valves, bones and skin grafts. If you have previously registered on this site, you may modify your records by going to: My Profile. If you joined the Registry at the Department of Highway Safety and Motor Vehicles, but have not registered on this site, your name should be on the Registry. We do, however, encourage you to create a personal profile so you are able to amend your record at any time. To create a profile, sign up below. We will confirm your registration by sending an e-mail directly to you. Entering your e-mail address will also allow you to update your information at a later date. If you don’t have an e-mail address, you may obtain a free address at Yahoo, Hotmail, or Google.